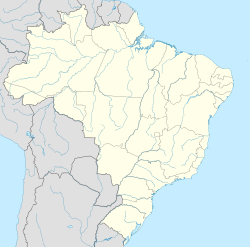 Dumont is a municipality in the state of São Paulo in Brazil. The population is 9,178 (2015 est.) in an area of 111 km². The elevation is 595 m. It is named in honor of aviation pioneer Alberto Santos-Dumont.Is also knowing for producing the world famous sausage of Dumont. ^ "IBGE :: Instituto Brasileiro de Geografia e Estatística". ww2.ibge.gov.br. Retrieved 2019-03-13. This page was last edited on 13 March 2019, at 11:22 (UTC).